Lowering kit for Honda NC750D Integra 2014 – 2018 reduces the seat height by 1.57 inches by lowering the rear suspension. High quality kit made in Europe.Will also with bikes with DCT dual clutch and ABS. Lowering kit for Honda NC750D Integra year model 2014, 2015, 2016, 2017 and 2018. This NC750D lowering kit lowers the rear suspension and the seat height by 1.6 inches. 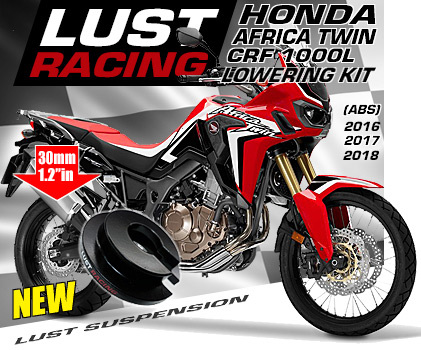 Top quality lowering kit made by Lust Racing – Europe’s leading manufacturer of high quality motorcycle lowering kits. Material special steel, powder coated in black, supplied complete with installation instructions. A lowering kit is the solution for shorter riders who find their bike to tall to reach the ground with both feet. By installing a lowering kit the bike becomes more stable and easier to handle. In addition to the lowered seat height also the point of gravity is reduced making the Honda NC750D Integra easier to balance for vertically challenged riders. This lowering kit will also fit bikes with DCT gearbox with or without ABS. Our price includes shipping! No hidden extras. We have the kit in stock ready for immediate dispatch. All orders are sent with tracking code. Get your Honda NC750D Integra lowering kit today!